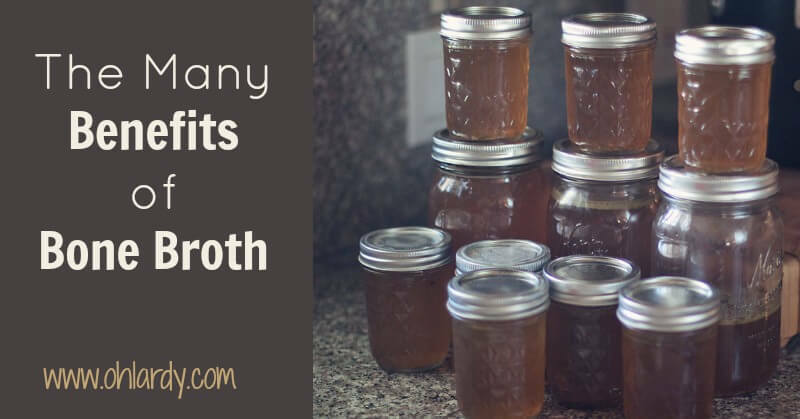 Everything You Need to Know About the Benefits of Bone Broth! Home » Recipes » Soups » Everything You Need to Know About the Benefits of Bone Broth! If your grandmother or great grandmother ever used chicken soup as medicine she wasn't just using an old wives tale. True chicken soup can be medicine! We have become used to our soups and broths coming in a can or carton from the grocery store, full of chemicals, flavorings and, oftentimes, MSG. This is not real food, folks. Chicken soup (or any broth) made the traditional way as a bone broth is full of healing properties! I always have some bone broth on hand, either bubbling away in my crockpot, instant pot, cooling in my refrigerator or stored in the freezer for future use. Bone broth is one of the most simple, nutritious, versatile, economical nourishing foods you can have in your kitchen! Many people (including myself) use the terms broth, stock and bone broth interchangeably. When I use the different terms, I am almost always meaning bone broth. There is a difference, however. Jenny from Nourished Kitchen talks about the difference on her blog, which I have summarized here. generally made with meat, a small amount of bones. Broth is simmered for a short time, usually under 2 hours. Broth is very light in both flavor and texture but can be rich in protein. Broth can be quite tasty on its own. generally made with bones and water and simmered for about 3-4 hours. Stock can be rich in minerals and gelatin and is usually used as a base for soups and stews. generally made with bones and cartilage, possibly a little meat. Many times bones are roasted first (especially for beef bone broth) to improve flavor. Bone broths are simmered for a long period of time (at least 24 hours) in a crockpot or on the stovetop. Bone broth is dense with a variety of minerals, gelatin and collagen. Many times, when the bone broth is cooled, it becomes a solid jelly-like mass due to its high gelatin content. It is important, if at all possible, to use quality bones from pastured animals. Bones from conventional factory farmed animals are not the same as nutrient dense bones from healthy grass fed animals. If you want the most nutrient dense bone broth, use bones from animals raised properly! I do, however, think any bone broth is better than no bone broth. There are many benefits to bone broth as opposed to stocks and simple broths. These are why I generally only use bone broths in my home. 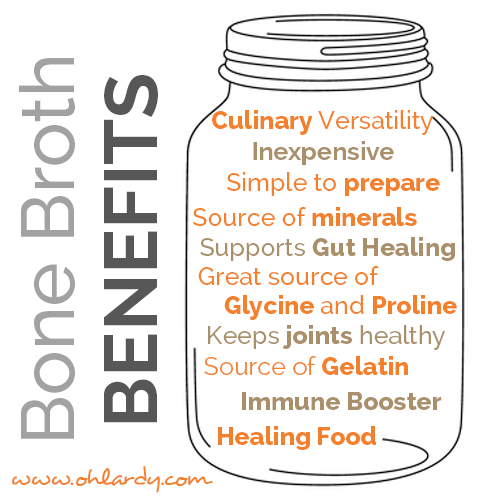 The myriad benefits of bone broth always astound me! Bone Broths can be used in your kitchen in a variety of ways. as a cooking medium for rice, quinoa, beans, etc. use in any recipe that calls for some sort of stock or broth. Often can be used in place of water in recipes (if the flavor profile makes sense). The cost savings alone are reason enough to make bone broth. Eating real food can be expensive but with some adjustments in the kitchen, many people can afford real food! A quart of organic chicken or beef broth can easily cost $4 or $5 at the grocery. You can make quarts of healthier and tastier broth for pennies, using bones that would have been discarded. This is a great way to maximize the money you spend on quality meat. If you are buying a whole pastured chicken for $20, you get the meat from the chicken AND quarts of stock from the bones. Often you can get bones for free from your butcher. Just ask! If you use veggie scraps you can stretch your dollar even further. Bones can be reused in broths until they begin to disintegrate. I have read that beef bones can be used up to 12 times and chicken bones up to 3 times. I will say if you reuse your bones, the subsequent batches of stock are significantly less flavorful. Want to really get the most out of the bones? Try Perpetual Bone Broth! We do this a lot when we are recovering from illness or an injury. Fats in bone broth can help restore gut health which will help with absorption of minerals. can help heal the gut. want even more gelatin? Add chicken or calves feet to your broth. Ask your farmer or butcher! A great source of the amino acids glycine and proline. Proline is essential to the structure of collagen and is necessary for healthy bones, skin, ligaments and tendons. Glycine helps detoxify the liver and is necessary for the body to produce the powerful antioxidant, Glutathione. Glycine also helps promote muscle repair and growth. Now that you have made your bone broth, how should you store it? I like to have a freezer full of quarts of bone broth to have on hand. It is amazing how much bone broth we go through! 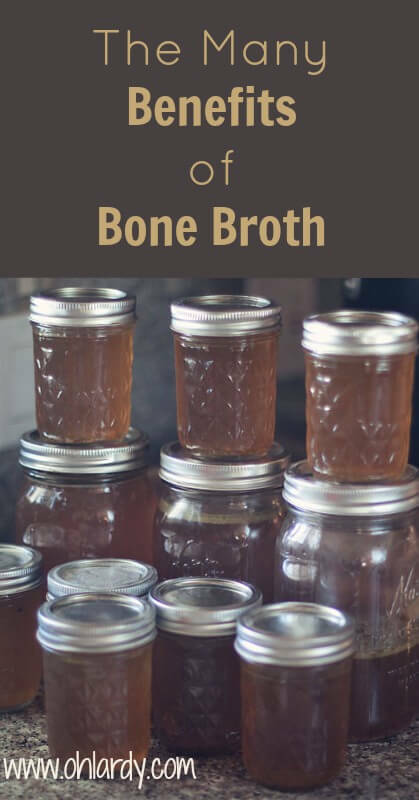 Keep bone broth refrigerated for 3-5 days in a mason jar or other storage container. Freeze bone broth in ice cube trays and then put cubes in a zip top bag. A great way to have small portions on hand for adding to recipes. Freeze bone broth in a zip top bag. Lay the bag flat to freeze. Then you can stack the bags. Thaw the bone broth in your refrigerator. All right! Are you ready to make some broth??? Looking for an alternative to broth? Check out my friend Nick Wallace and his new company, Bone Broth Brothers. They have a brand new bone broth powder that is perfect for smoothies and other healthy snacks. You can also add dried gelatin and collagen to your foods. It isn't bone broth but still a great way to get some in your diet!!! Worried you might mess up? Grab our book and you will learn to be a bone broth master in no time! I am having the hardest time finding grass fed beef bones. Everywebsite I’ve found is sold out. Where do you buy yours? I use the bones from the farm where I get my meat. I either use chicken bones from roast chicken or beef bones. Where are you located? You can find many farms at http://www.eatwild.com to see if there are some in your area. Did you check out http://www.uswellnessmeats.com yet? Look under ‘tallow, marrow’ They should have some! Good luck! I was able to find a place only one hour away that has wild, grass fed bones. So I made a batch of bone broth. I browned the bones really good, like you showed in the pic, added carrots, celery, onion and garlic ( I did not add any salt or pepper or anything). I cooked it 24 hours and it looks great! ( I have not chilled it yet to see if it will turn jelly like – tho I think it will).. anyway, I am having my first cup of it and it tastes nothing like what I expected. I’m assuming because there is no actual meat or salt in it.. but it almost tastes a little like coffee or tea. Is that right? I like it a lot, but was just surprised and was wondering if that is how it is supposed to taste. Hmmm…mine tastes a little more like a beefy tea but it probably depends on what kind of bones you uses (i.e. which parts of the animal). If you did not season with salt or pepper, that could be why too. I bet it will gel really nicely! You many also can the broth instead of freezing. It is convenient since you don’t have to thaw it out before use. Pressure can, right? I got a pressure canner for Christmas but haven’t used it yet. Can’t wait to try! I wanted to add a few things. 1 – You can make bone broth in a pressure cooker too – not a canner, a regular, smaller pressure cooker. Add a glug of Apple Cider Vinegar to help leach minerals from the bones, and it only takes 25-30 minutes at pressure to turn your bones/meat into an amazingly thick, rich broth! So much faster than the slow cooker, and my broth sets up so thick, after chilling it will hold a spoon upright. 2 – If you use quart jars to freeze your broth, only fill them 3/4 of the way full, secure lid tightly, and lay them on their sides. The freezing liquid thus has room to expand, and the jars don’t break! 3 – You can boiling-water bath can your jars of broth, if you’d rather have them ready-to-use instead of frozen. Use the hot-pack method in hot jars and process as per USDA/Ball Blue Book recommendations for 15 minutes. 4 – The bones you use DO make a difference. I tried making my normal pressure-canner broth with a CAFO-raised broiler from the grocery store (twice, and a 3rd time with a non-organic Costco bird) and the broth turned out thin, GREY and actually rather stinky!! But my farm-raised, and organic birds, all turn out a lovely golden color with great taste and smell. Sure made a believer out of me!! I belive the bones of homegrown chicken ,there is good value for your body.. If you cannot find grass fed animals, you can proceed with comfort if you discard the fat which rises to the top of the container when cooled. I suggest you discard the fat in your regular trash. The reason is that the fat is often where the GMO elements are stored as well as herbicides and pesticides picked up in the feed. I’ve also started to throw any bones from any meal into a freezer bag and use them when I make my next broth batch. Good tip! Yes, the fat is where most of the ‘junk’ gets stored so ditching that is a great idea if pastured animals are not available! I recently bought chickwn bine broth frozen from my local farmers marke to try. Am I able to refereeze again? I am thawing a quart and want to make a cup to drink and try…then put the rest in ice cube trays to reuse more conveniently….? I am attempting to make my first Chicken Bone broth. I went to the local health food store and got a large package of frozen “young chicken bones”. I brought it home, and it’s pretty big so I put the whole frozen thing in a pot and I am currently simmering it. However, since it is frozen, should I have waited to thaw it before beginning to cook it? I just figured I would cook it on a really low temp. and it will thaw on it’s own. Then I can cook it for 24-36 hours. Is that a good plan? Thanks.